If you have a collection of Gzhel porcelain, ask yourself if you like this kind of folk craft or if you just want to decorate the interior originally. If so, why not use gzhel as a starting point in creating your kitchen design? 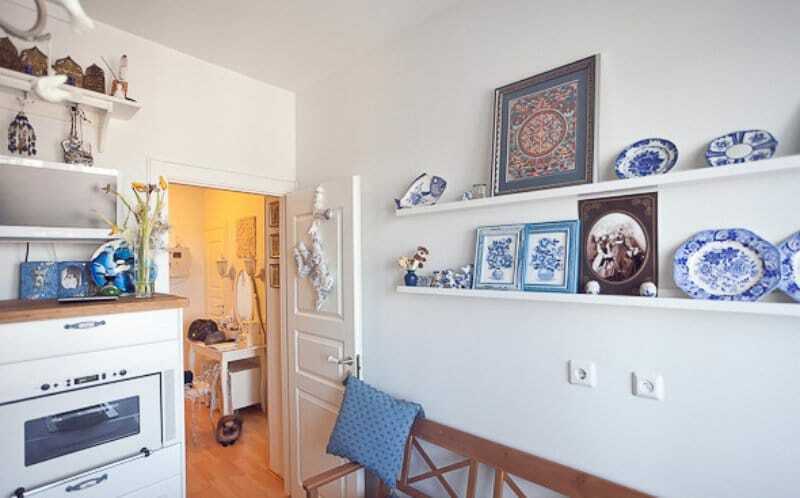 After all, its fresh, white-blue scale and beautiful flower or subject painting have a huge decorative potential. On the other hand, putting Gzhel in the interior is not entirely simple, because of its brightness, the “coldness” of the color and the activity of the pattern. 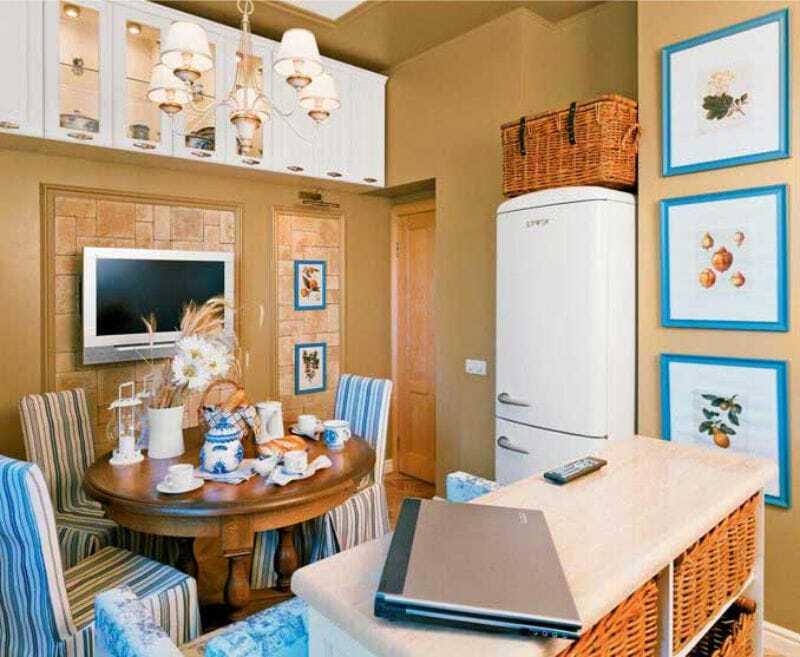 Let’s find out how to avoid these mistakes, and what principles need to be followed in decorating the kitchen in Gzhel-style. 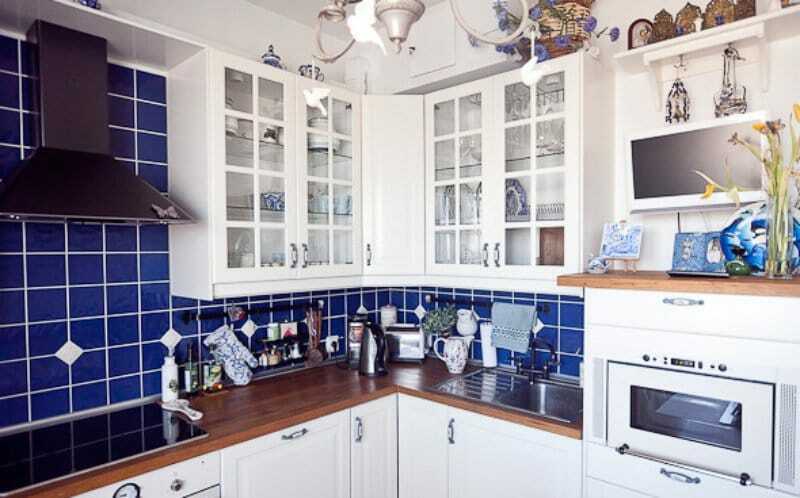 The blue-and-white kitchen in Gzhel style can look fresh and appealing only if most of the time it is well illuminated by the sun. 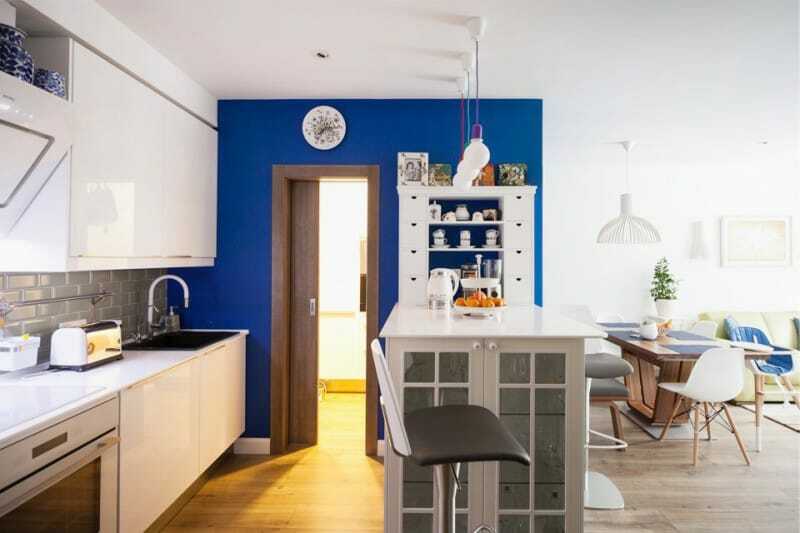 But even in this case, blue color should not be used in large doses, otherwise the interior will become too gloomy and cold. 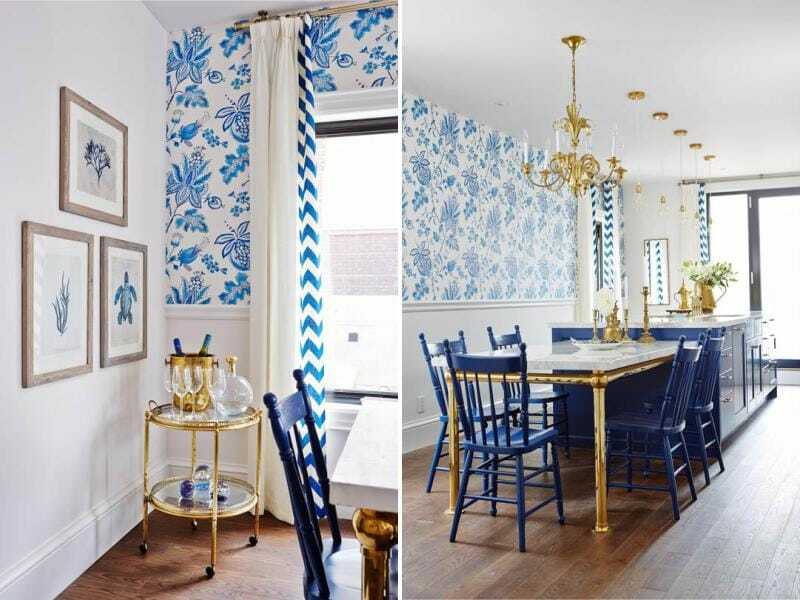 And if the room is dark and looks out to the north, then the blue color is permissible only as an accent. 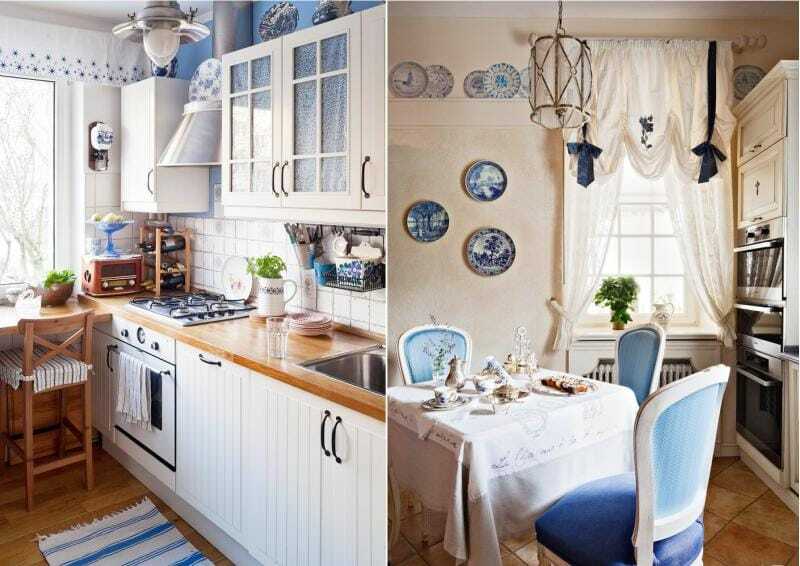 If you do not feel confident about the color design of the interior, then apply a win-win scheme: white walls + neutral color floor + a suite with white facades + white furniture + white-blue curtains or one blue / white-blue wall + accessories in gzhel style. 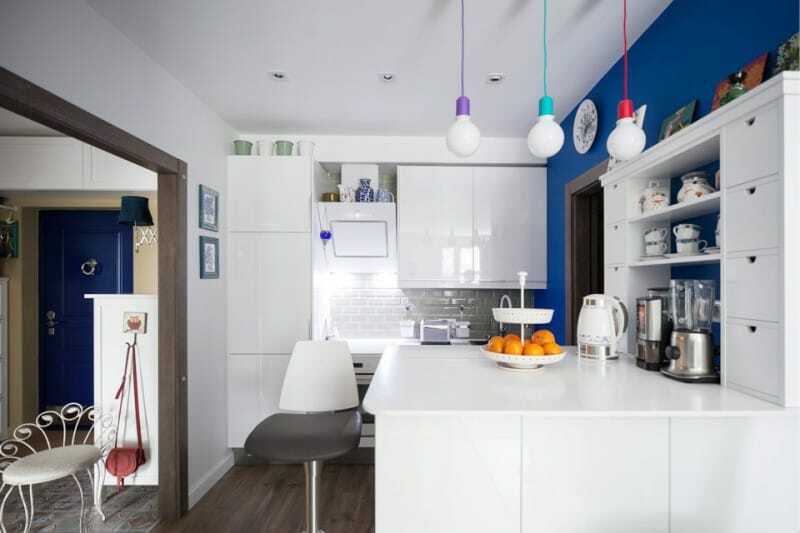 Below is an example of an interior with a more complex color scheme. 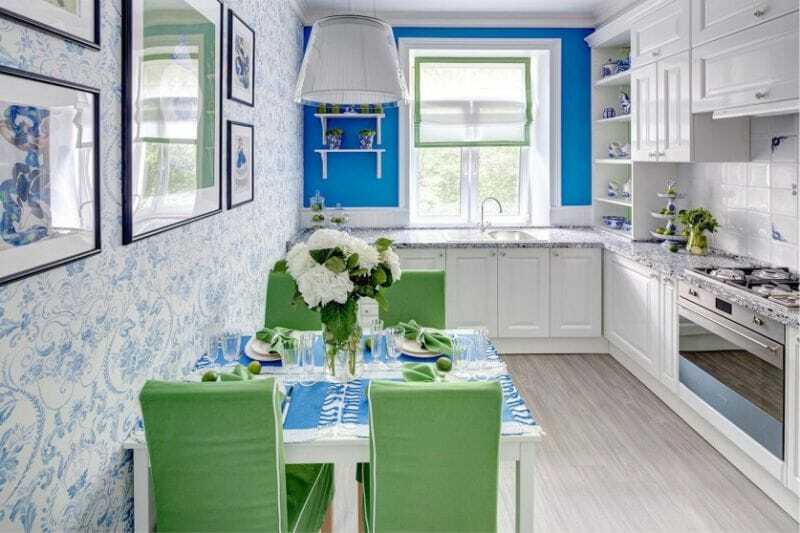 Here, the designer Eva Bergman supplemented the Gzhel style kitchen with green accents. The closest relatives of Gzhel are white and blue Chinese and Delft porcelain. If desired, these motives can be combined. 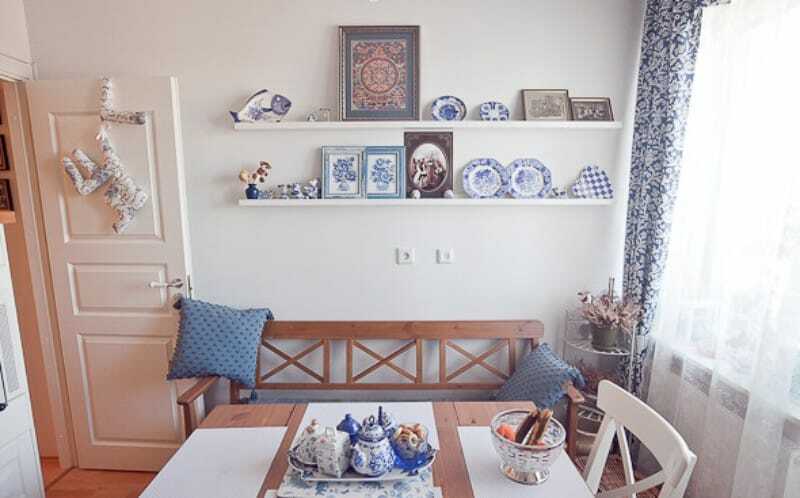 So, for example, the upholstery of a sofa with Dutch landscapes (in the style of painting of Delft porcelain as in the photo below) will harmoniously coexist with Gzhel cookware on the table. 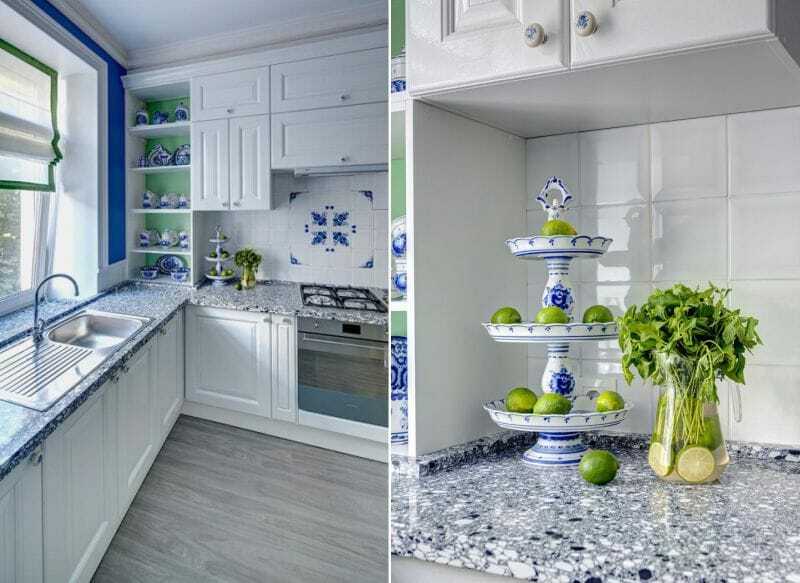 Approximately 80% of the surfaces in the kitchen should be monophonic or have an unobtrusive texture.That is, if you want to trim the apron with tiles in Gzhel style, then the kitchen set should be just plain white or blue. 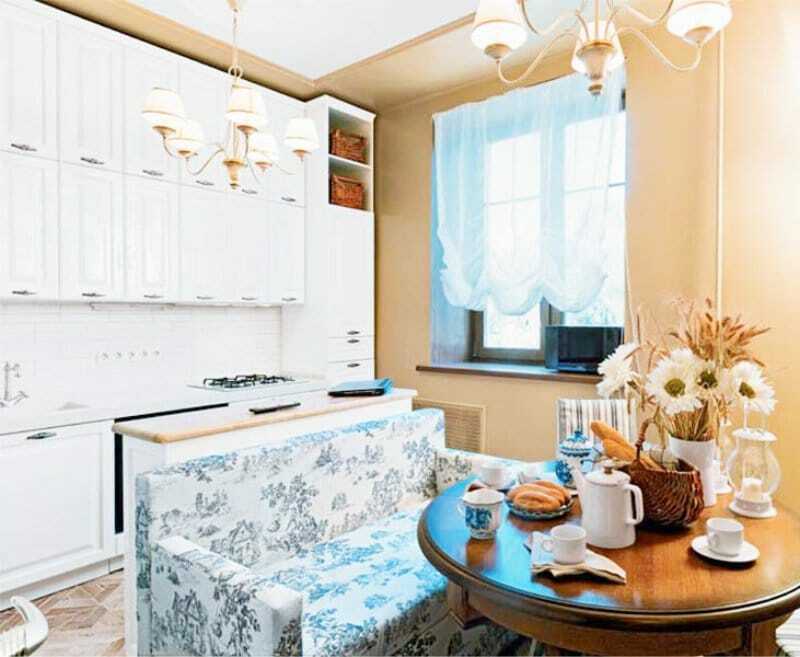 Before you begin to repair and design the Gzhel kitchen, it is worth planning its design to the last detail in advance.This way, you will avoid mistakes and be able to come up with interesting combinations of textures, prints and colors. 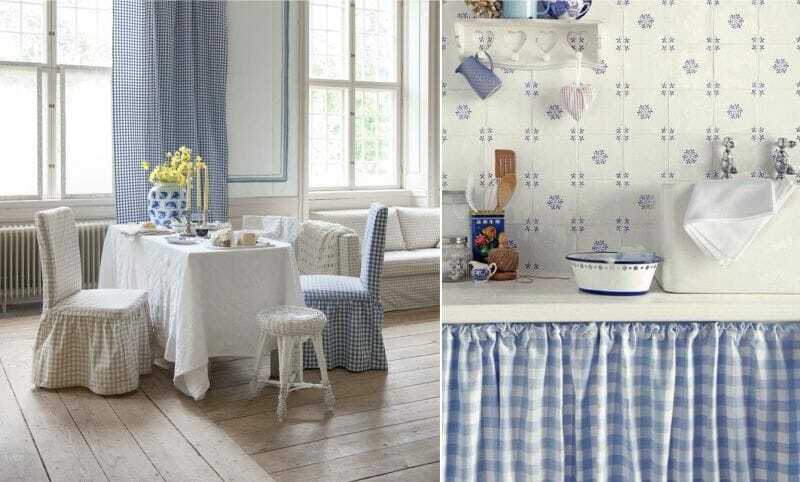 Do not simultaneously decorate kitchen appliances and accessories such as aprons, curtains, kitchen textiles, dishes, chandeliers, souvenirs and furniture with white and blue hues. It is enough to have dishes on the table, collections of accessories on a decorative shelf and, say, a tile or glass panel in an apron in the Gzhel painting style (pictured). 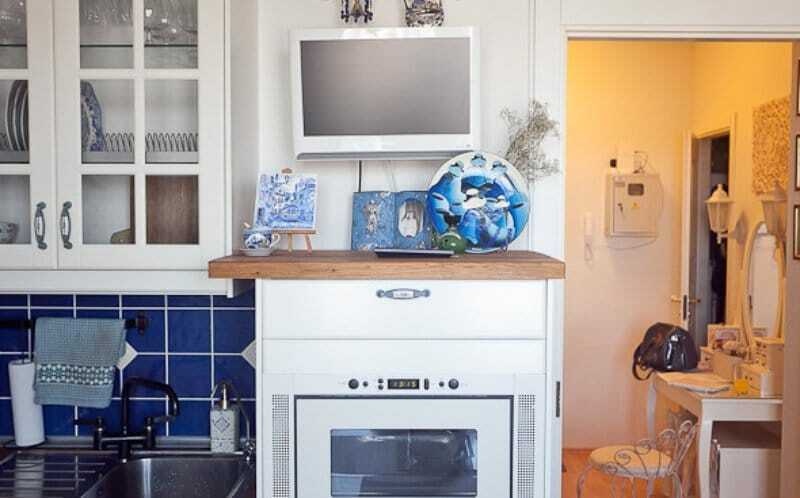 If your kitchen is small or narrow , then the measurement figures also need to be known. 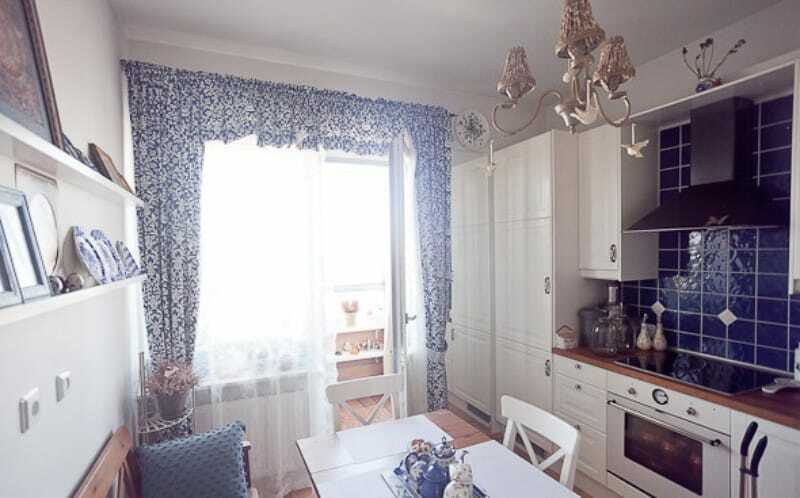 Wall décor in form of large floral patterns is not desirable here. However, if you choose, you can spare one wall for the wallpaper in the gzhel style, and the rest should be painted white or blue. Trees are warm and natural materials that perfectly complement the coldness of blue. 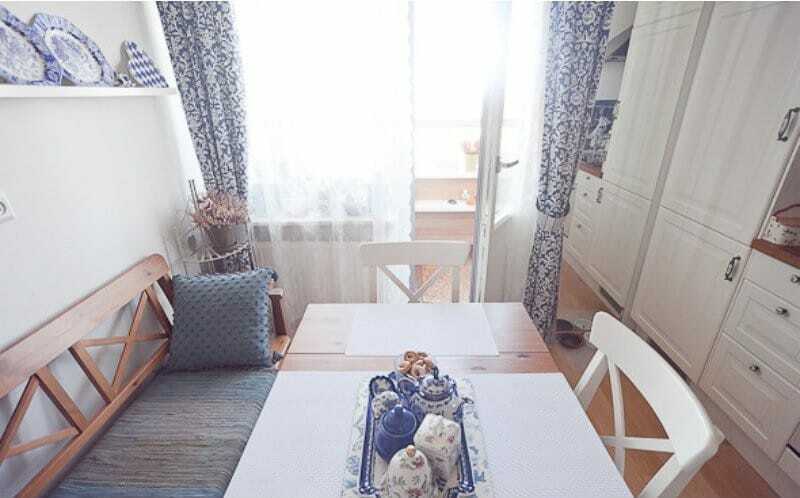 If you want to create an atmosphere of coziness in the kitchen, opting for a wooden floor, table top and / or the furniture will help you achieve this. 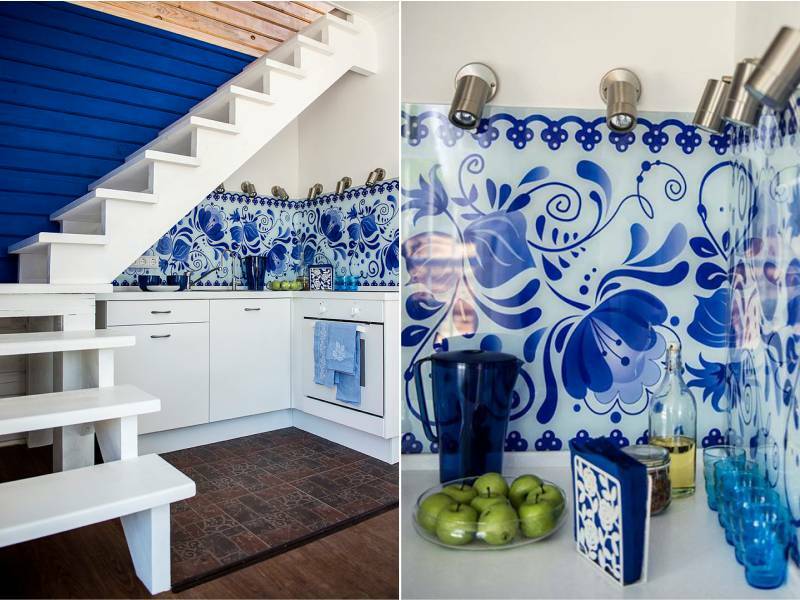 Another way to decorate the interior of the blue and white kitchen in the style of Gzhel is to add gold-plated or bronze details. These can be accessories like a kitchen knob , a mixer, a chandelier, candlesticks, vases, dishes and furniture elements as on the photo below. 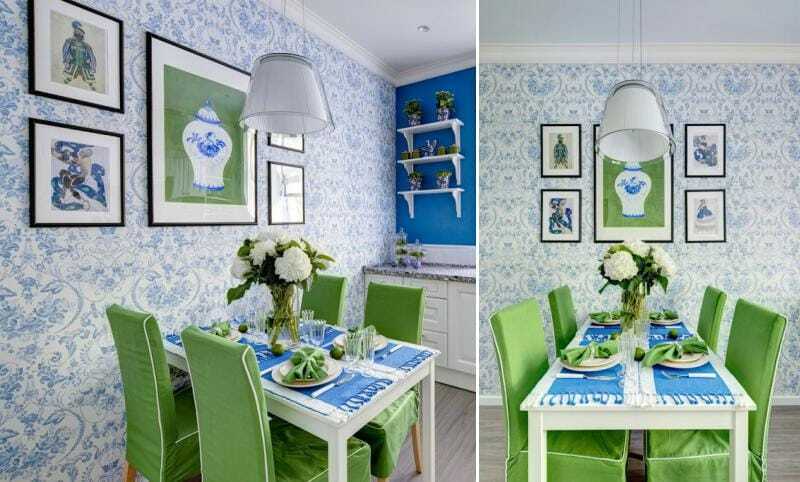 To make sure Gzhel in the interior of the kitchen does not look boring and obtrusive, add to the layout a few simple and classic prints: peas, cage, diamond or strip. 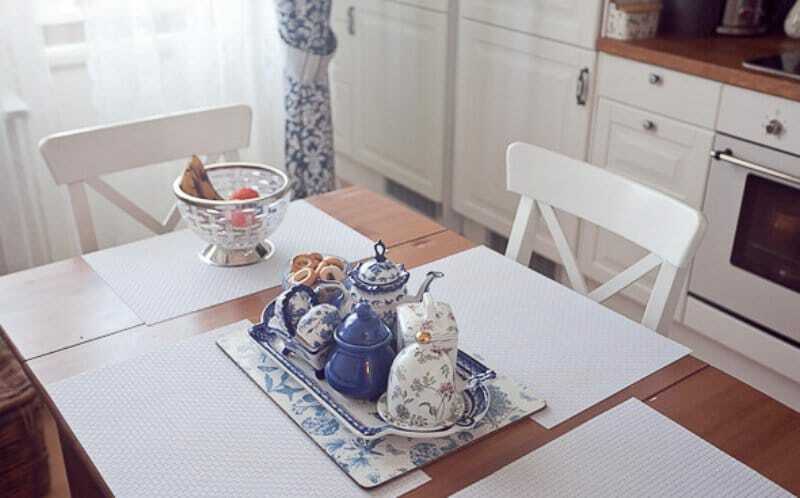 They will look best on curtains, furniture upholstery, pillows, tablecloths and other kitchen textiles. This way, the layout will be more laid-back. 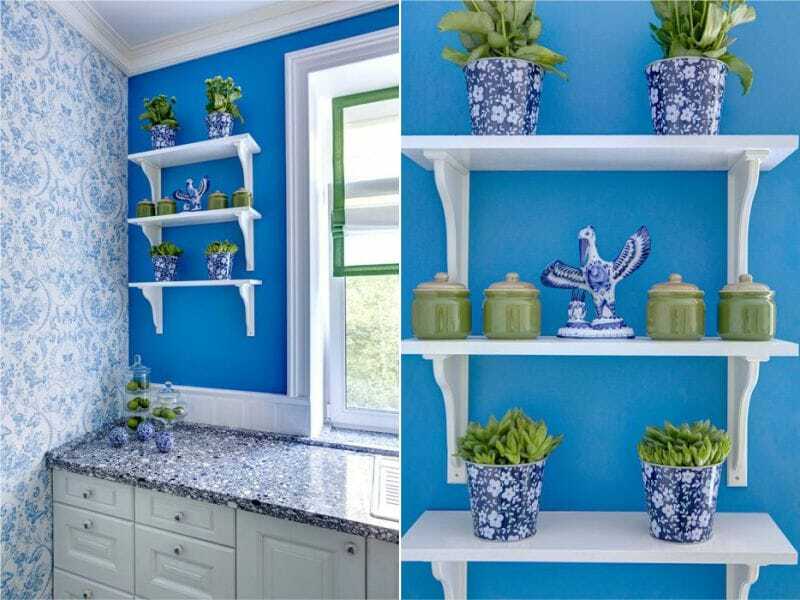 In this case, also remember that in a kitchen with solid walls it is permissible to combine two or three different prints, and if the walls or a large fragment of the walls are decorated with a pattern, then you can use textiles of only one or two colors with merely one or two kinds of ornaments (peas, cage or strip).